របៀបបញ្ចូលទឹកប្រាក់ ហ្គេម Garena ជាមួយនឹង Garena Shells. 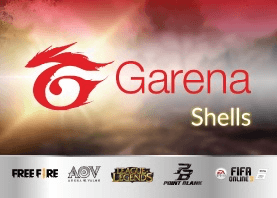 Garena Shells គឺជា រូប៉ីយប័ណ្ណ ឬជាលុយ តាមអ៊ីនតឺណេតសម្រាប់បញ្ចូលទៅក្នុង ហ្គេម Garena ដូចជាហ្គេម Free Fire, ROV, Contra Return, League of Legends, Point Blank, និង FIFA Online 3. ទិញ Garena Shells តាមរយៈប្រពន្ធអ៊ីនតឺណេត (online) ប្រកបទៅ ដោយមានភាពងាយស្រួល និងឆាប់រហ័ស!